The Turtle Hospital In Marathon Florida Keys is a lovely place to visit. Most times you visit a place like this, you will move through room after room looking at pictures and exhibits in glass cases, all very interesting but you really want to get hold of the things. And the attraction, being a live working animal hospital, certainly promotes a hands on approach. Since the Turtle Hospital first invited the general public through its doors in 1986, it has successfully nursed over 1000 sea turtles back to full health and all the while holding firm to its original goals. But why should you visit the Turtle Hospital you may be asking? Is it good for all the family even little kids? And how long should you allocate for a visit to the place? Well my readers, we will answer all of these, but let’s start with…………. How Do I Get To The Turtle Hospital In Marathon? If you head down the Overseas Highway or US1 as you will do most of the time travelling around the Florida Keys, you should first head for Marathon. Marathon is known as the Heart of the Florida Keys as it’s about halfway from Key Largo and Key West, who sit at the ends of the chain of islands. So if you are at the Southernmost point and fancy a trip to see this wonderful facility, then it will take you about an hour to cover the 48 miles. And if you are at the other end of the Keys, and want to go then it will take you about the same, as Key Largo is just another couple of miles further on at 50 miles. And that is the beauty of the Turtle Hospital, wherever you are in the Keys it’s only a short drive, down the Overseas Highway to get to. Oh yeah, whilst you are driving down to the Turtle Hospital make sure you keep an eye on the Mile Markers that you see by the side of the road which indicate if you have gone too far. So What Do They Really Do At The Turtle Hospital Then? The organization have four main focuses to their daily workload, before they even think about performing the daily tours around the Turtle Hospital for the crowds of interested visitors. Number One – They nurse injured turtles back to health and then free them back into the oceans to live happily from where they first came from. Number Two – They ensure that a comprehensive programme of education occurs throughout the community, and most importantly at all the local schools. Number Four - They work towards environmental legislation making the beaches and water safe and clean for sea turtles. What Type Of Operations And Injuries Do they Deal With? An interesting fact before we start talking about the injuries that befall the poor turtles that are brought into the Turtle Hospital every week, is the majority of the equipment you would think would be animal specific. But in fact most of it has been provided by local doctors and hospitals that had used it previously on humans all over the Florida Keys. Which is ironic as literally all the injuries that occur to the damaged sea Turtles brought into the Turtle Hospital, are because of us, and what we leave behind us. But they have to rely on donations from human doctors to keep this place going. But what about the injuries, you maybe thinking. 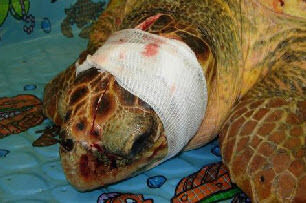 Well they range from flippers being amputated because of entanglement in left behind fishing lines or ropes, turtles getting hit by boats causing damage to their shells, and stomach problems from swallowing left behind rubbish. We could prevent all of these things from occurring (or at least the majority) with a little more thought. The most common surgery performed is the removal of debilitating viral tumours that affect over 50% of the sea turtles in the Keys and around the world. These tumours are huge problems, which the Turtle Hospital has spent years working on their preventative research. They have successfully proved that these are actually infectious and are passed from animal to animal. Now the battle continues to work out the cause. When releasing the turtles back to the sea, you may think that you can just throw them in and they will swim to where they want to be. Dependant on breed the turtles are released in a variety of ways and at different locations. The Green Turtle are carried to two spots via an ambulance for their release into the wild. Pigeon Key is the first suitable location for release, whilst after a slight drive of 20 miles they will slip into the Florida Bay up in Marathon and swim away. Did you know that nowadays the Green Turtle are protected after becoming endangered due to their low numbers in the wild? But that wasn't always the case and throughout the history of the Florida Keys they were once a sought after food source. They were caught by dropping "Pens" into the water known as "Kraals". Loggerheads will find themselves predominately released at Pigeon Key, or sometimes taken much further out to sea where they will hit the water off the side of a boat in the gulf or ocean. The variety of turtle known as Kemp’s Ridleys have the longest journeys of them all, with a 70 mile trip west of Key West, where the coral reefs around Dry Tortugas make the most suitable homes. All this costs money so a few small donations would not go a miss if you decide to visit. How Do I Arrange A Visit To The Hospital? If you do want to go on a guided tour of the hospital facilities this can be arranged, by phoning 305-743-2552. Please note that the groups are of limited size, so if you have a large party then extra arranging maybe required. The tours run daily at 10 am, 11 am, 12 pm, 1 pm, 2 pm, 3 pm, and 4 pm. During the 90 minute tour you will get to see all the hospital facilities, and spend quite a bit of time looking at the rehabilitation area, where the sick and injured turtles are getting themselves back to full action. The highlight is at the end where you can spend time with live turtles and feed them too, which will delight both young and old a like. Is It Good For All The Family? It certainly is a great place to visit although very little children might get a bit bored. I wouldn't consider taking a child under the age of five to be honest but if your child has a greater attention span than mine, then feel free to ignore that piece of advice. I have been three times now, and always find it an interesting and informative place to go, and my kids who are now 8 and 11, I feel are at prime age to get the most out of their visits. The tours and educational programs occur three times per day at 10:00am, 13:00pm and 16:00pm.